It’s nice to escape from campus every so often to have some comforts of home. For me, it’s my uncle’s house in Clifton Park. I go there quite often to see them and to get away from school for a bit. In past years, my roommate and I would pack up and stay there for a weekend to go to my cousins’ soccer games, get some work done, and to get some laundry done, too. This year is a little busier, so I haven’t gotten to go was much as I’d like, but I got to spend an entire day there today! I went there to watch my two month old causing while my aunt went for some errands and wound up going to a soccer game and staying for dinner! I had planned (as I always do) to get some work done, but that plan sort of failed. 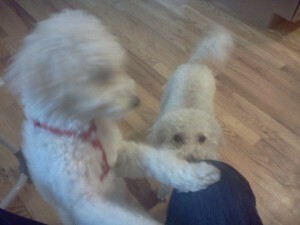 I always bring some sort of work to do and I usually can be productive, but these two puppies had some other plans. When I typed on my computer, they pawed at my hands to pet them. When I sat at the kitchen table, well, they decided to scratch and pull at my leg to get my attention, like in the picture. In the end, they won, and procrastination began! I’ll just call this puppy therapy and do my homework tomorrow.